One rain-soaked evening in mid-April my wife and I had just finished watching The Martian and were getting ready for bed with our usual routines of turning off lights, loading stray items in the dishwasher, and finding stray toddler shoes to put back in their proper place when she came running up to me and said “I have a great Weekly Fifty photo for you!” Since it was nearly 10:30pm and we were about to turn in for the night I had no idea what she was talking about and at first thought it must be some kind of joke or prank. I followed her down the hall to our front door where we could see a tiny pair of green feet through the window in our front door, and the little triangle of a frog’s mouth sticking up right between them. 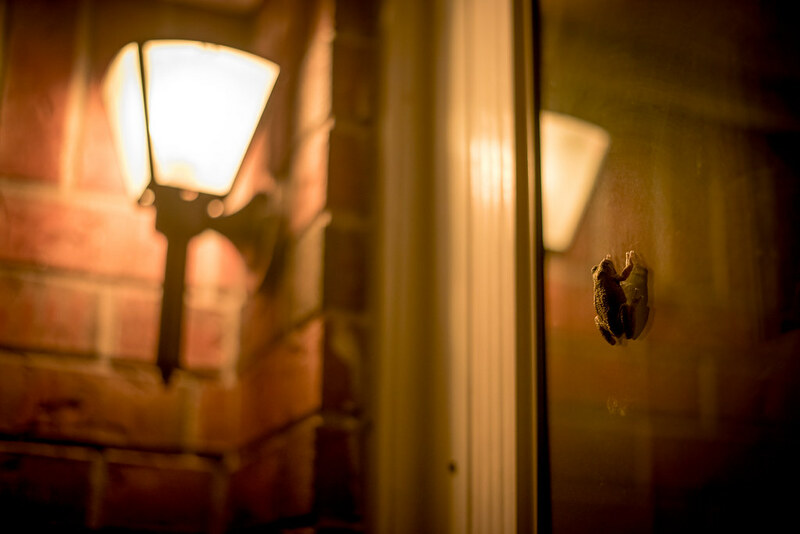 Somehow a small frog had found its way to our front door and climbed almost two meters up on the glass so it could be close to our porch light, and there we were just staring at it through the window sort of dumbfounded at the whole situation. 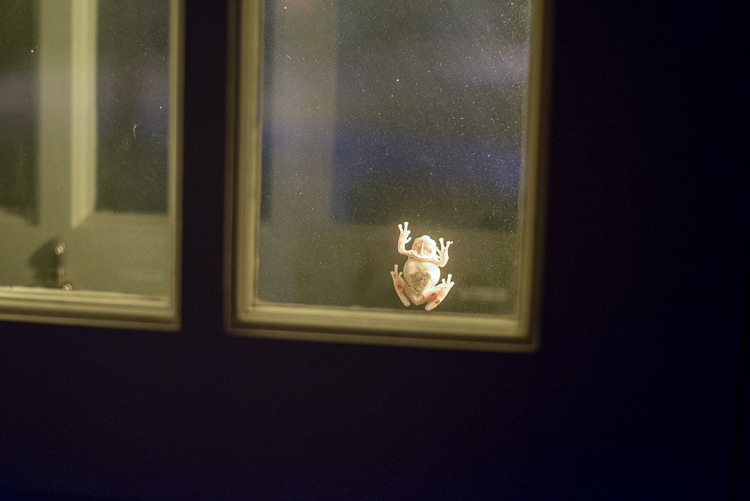 I quickly ran to grab my D750 since there was not much light and I knew I would need to shoot at some high ISO values to get a decent photo of the frog, and we spent a good ten minutes trying different angles from inside the house without much success. It’s not that the frog itself was moving around or in a particularly bad position for a picture, but that all the images we made seemed to be somewhat devoid of context. Sure you could see a frog…but so what? The pictures we got were not all that interesting and certainly did not invite the viewer to look at them for more than a few seconds, if at all. My wife encouraged me to get up on a chair or stepladder and try some varying angles and while they were better than any shots I was coming up with, it still felt kind of lifeless and empty. All the pictures I took from inside the house were OK, but felt like more like snapshots and less like well-composed photographs. Anyway, I hope you like the final shot. I sure do, and to me this serves as a perfect illustration of how it’s important to use your camera every day and build up your knowledge of the fundamentals so when a cool moment like this strikes you are ready for it. That’s a cute shot…and you’re right…having your camera ready is a must…and having a partner that watches out for you is especially helpful! Ha! Reminds me of a mystery novel, except the detective is a frog! Mysterious! Really cool photo today. ‘Subject. Context. Composition.’ This needs to be our mantra! I like your shot using an aperture at f1.8. It puts the focus (pun intended) on Froggy. I am surprised that an ISO of 500 yielded this result. The only light was provided by the lamp and not an off the camera flash? I would have assumed that a much higher ISO would have been necessary. Nice job! I was surprised at the low ISO also, David! As I prepared the shot I was thinking that I would have to use a much higher ISO but that turned out to not be the case. And yes the only light was from the lamp which, despite how it appears, was not actually very bright. I’m glad you like the photo! What a difference between the 2 pictures!! THanks for the reminder to keep on looking until you find the right angle. Oh, and neat that the 2 of you work together like that. Thank you Jacqueline! It was fun to keep trying a few angles to see what might work better, and the whole thing taught me that I need to do a better job of keeping my eyes open for new and better ways of shooting things!